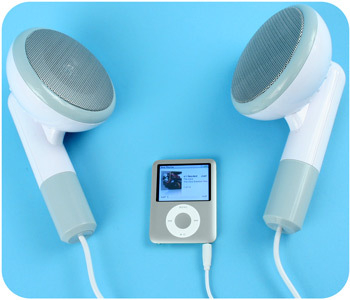 Holy giant iPod heaphones, Batman! These are freaking awesome, and is a perfect example of simplicity, satire, comic, kitsch (but self-aware), and some form of (post)-postmodernism… although I’m not sure which. Don’t think I would buy or use these, but well done. No idea how good they sound though, so beware. More pictures after the fold. I’ve been needing a new watch for awhile, and I really dig the M&Co. watches. I don’t need crazy accurate swiss movement or tourbillion whatever. All I want is something simple, with a twist. Tibor Kalman really does it for me, and his 10-One-4 watch (shown above) is a real work of art in my opinion. Consider this on my wishlist. More pics of other M&Co. watches after the fold. The Seletti design house, responsible for the glass “plastic” bottles, has won my heart over with these porcelain cups which are cast into the shape of crumpled plastic (Solo) cups. It’s like they took the trashiest thing from a college dorm room and transfigured it into sheer awesomeness. I need to start a wishlist for things to outfit my apartment with once I graduate. More Seletti design after the fold.